Discussion in 'Politics & World News' started by eric strt6, Jul 6, 2013. 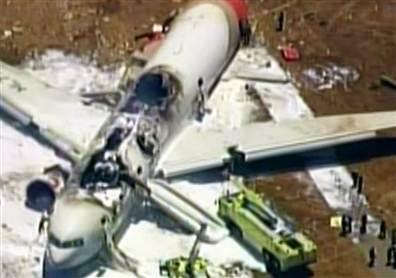 07-06) 12:33 PDT San Francisco -- A Boeing 777 jetliner bound from Seoul, South Korea, crashed and caught fire while landing at San Francisco International Airport at about 11:30 Saturday. The plane, Asiana Flight 214, came to rest on the side of the runway. The airport remains closed to all traffic and emergency teams are on the scene. 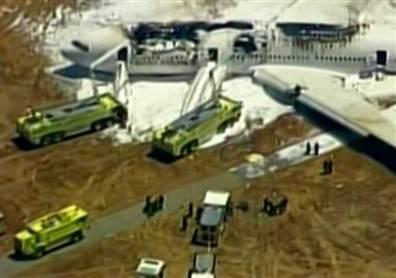 No information is available about whether the airplane was carrying passengers or on the condition of anyone aboard. someone came in too low. came in too low...plane hits edge of jetty...debris in water....from edge of water down the fvcking runway. just going by the news. 2 dead 40 critical with burns, 20 with moderate injuries. Reuters says 1 dead. Won't surprise me if the cabin fire doesn't result in more later. What a mess. Thats a hell of a tail strike. Due to construction, the instrument landing system on that runway has been out of service. There are GPS approaches they are using though, and the aircraft flight management computer should still generate an approach path that is essentially the same thing as the instrument landing system, so unless they set up something wrong, it's unlikely that the ILS being out itself is the cause, but it's definitely going to be one of the first things that's looked at. Big aircraft like that don't really fly clear-day "visual" approaches, even though they can and they practice them in the simulator, even on clear-days they usually follow an instrument approach of some kind to ensure they are on the correct approach path, descent rate, etc. Landing big aircraft like that simply from visual indications gets quite tricky. Watching on CNN now. **** yeah. And THIS ladies and gentlemen is the result of stringent airworthiness regulations and the result design requiremts. Just like the air France incident in Toronto a few years back. Major Incidents with newer aircraft resulting in almost no fatalities? This is proof that the system works. Yeah, that part amazes me too. Most people think flight attendants are there to serve drinks, but they are really there to throw your a$$ out the door in the event of something like this. Being able to evacuate a large airplane in less than 90 seconds (the standard) is pretty amazing. Although there's still much that likely went wrong, survivability has increased dramatically in the last 10-20 years. Mos people don't think about seats much, but a seat failing is absolutely unacceptable and can turn something that should be survivable into something that kills. There are some amazing fire-rescue vehicles that pierce the fuselage with a big spike and then spray foam like crazy and fill it with the stuff so no fire can burn. Those guys train their a$$es off too. There's an Asian driver joke in here somewhere, I can feel it. Sounds like pilot error. JM is probably right on the tech stuff noted above. Even still, he should be able to land without the electronic aid. Airport technology called the Instrument Landing System, or ILS -- which normally would have helped pilots correctly approach the runway -- was not operating at the time, according to a Federal Aviation Administration bulletin. Tomorrow is my fathers birthday. When I give him a call I expect to be lectured on how this is Obama's fault for at least one hour. Will it go something like this? It was, but the hour elapsed and now it's the fault of the tea party, Chavez, and Tiny Tim. The guy who watched it crash said that it's possible that if the nose hadn't been so high, the tail might have missed the seawall. ....the plane would not have been stalling, it would have been going faster. It sill may not have been pretty, but who knows...it might have been way less ugly. Hmm when is Toshi going for his pilots license? Interestingly the post crash fire didn't seem to orginate at the wings, where the fuel and hot things are. I'll be super curious how the fire in the cabin started. While it was bad I can only imagine how bad it would have been had 25.853/.856 not been complied with..........YIKES!!! Interestingly the post crash fire didn't seem to orginate at the wings, where the fuel and hot things are. I'll be super curious how the fire in the cabin started. Avionics or batteries? I don't know how the 777 is laid out. It sounds like the gear got ripped out so only teh FSM knows how sh*t got knocked around while power was still applied. e: "what are you? a lizard?" Read one eye witness (yeah yeah I know) that said there was a second explosion a minute or so after the aircraft came to a stop. Actually, the fuel and hot things pump air into the fuselage, this has distributed fire like you wouldn't believe in ground-accidents in the past. One I seem to recall was a DC-9 or variant thereof. The pneumatic system spread the fire from one of the engines into the cabin and many passengers died. It's plausible that the pneumatic system could distribute a fire into there if the conditions were right. Then there's also the flash-fire issue opening all of the exits with air rushing into the aircraft and fanning any flames. The fact that it burned the top like that would draw me to the pneumatic system though. Since everything is largely intact it should be fairly easy to determine.